The Ranch has remained very good despite all the crazy fall weather we have had. There are large pods of feeding fish throughout the entire Ranch. 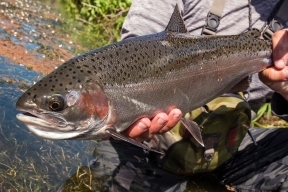 You will find trout eating Midges and Blue Wing Olives most of the day. I would start my day around 10:00 AM and depending on the weather you should have great fishing all day. With all the vegetation in the water landing some of these fish can be a challenge. The problem this time of the year is being able to see your flies. I would have a #20 or #22 BWO No-Hackle. I have also done well using a Hackle Stacker. They are very hard to spot in the flat light. Don’t be afraid to tie on a #16 Adams as a lead fly. The water in Harriman on up through Island park really is about as good as it gets. Get up here and see for yourself. You will not regret it! 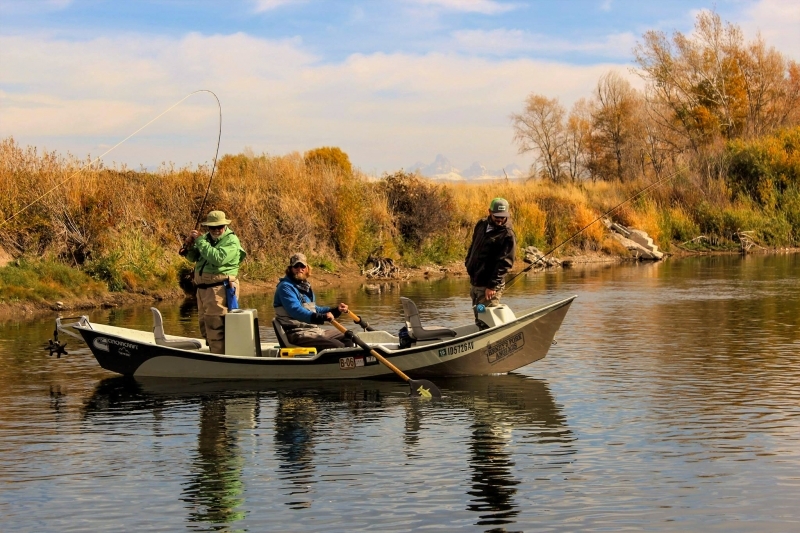 Look for the overcast cloudy days for the best dry fly fishing. On bright days the lower river is not getting much in the way of hatches but the nymph fishing has been good. Last week Mike and I fished in the Saint Anthony area on a beautiful day and while we didn’t see any fish eating on the surface we did have a pretty good day fishing nymphs. A #10 brown Rubber Legs with a #16 or#18 brown Zebra Midge worked very well. We both hooked about a dozen fish a piece. We did have to sort through a few whities and one real nice sucker! On the overcast day look for trout eating Blue Wing Olives and midges. You can get away with #16 and #18 Blue Wings and I would fish a #18 or #20 Midge Pattern. As of last Friday I did not see any Brown Trout digging up gravel. However I do think they are staging up so the spawn should start anytime. It’s streamer time on the South Fork. Brown Trout have gotten aggressive as spawning time approaches. I would make sure whatever pattern you choose that you have it in multiple colors. A white Zonker has always been one of my favorite patterns this time of the year on the South Fork. There are also still plenty of Blue Wings on the South Fork so don’t be afraid to spend a little time on the riffles. You can have some great day’s dry fly fishing on the South Fork this time of the year. I have seen days in the fall when it seems as though every fish in the river is up and feeding on the surface. If you’re not seeing the Blue Wing then I would go back to the old tried and true, a #10 brown Rubber Legs with a #16 or #18 red or olive Zebra Midge. The upper Teton continues to have great Blue Wing Olive hatches. A #16 or #18 Hackle Stacker has worked very well. Once again it will depend on the day. Having good cloud cover is the key for the better hatches. Again I would have streamers and small bead head nymphs. 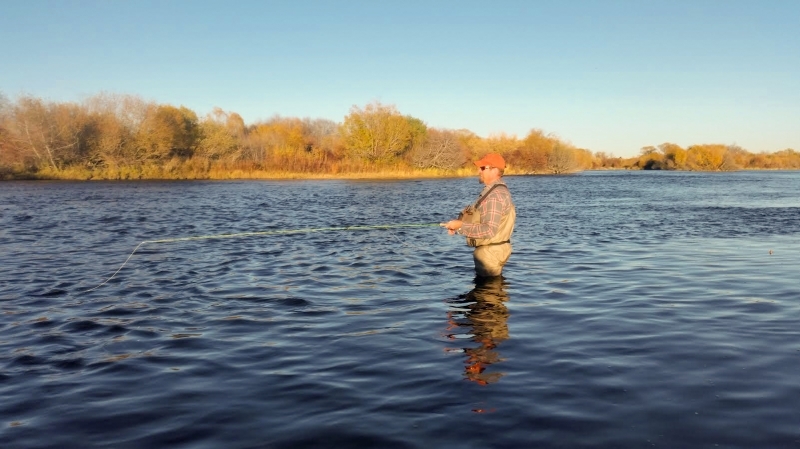 The Madison continues to fish well this fall. The patterns are not going to change much but I would add some midges to the mix. Again small bead heads and I really like to fish San Juan worms on the Madison this time of the year. A #16 or #18 Red Lighting bug can really work well this time of the year as well. As I have said before don’t forget the streamers! Fishing between the lakes can really be great this time of the year. I like to fish near Quake Lake this time of the year. You can find a Brown Trout of a life time in this section of the Madison. Articulated Dirty Hippies. Little Kim’s and Sparkle Minnows are a few of my favorites this time of the year. Henry’s Lake continues to be the hot spot. Large fish are being caught all over the lake. I would Scuds and Leech Patterns. The State boat ramp seems to be the spot. Please keep in mind that it is a boat ramp and there are plenty of signs letting everyone know that fishing on the ramp is not allowed. There have been some conflicts up there over the last couple of weeks. I would also not be afraid to give Island Park Reservoir a try. Fishing a #16 flash Back Pheasant Tail has worked very well. I would also suggest stripping a Crystal Zonker off the banks.